It may be Tea Zone by name, but it’s a bakery/cafe/restaurant/tea shop by nature. The address is also a little confusing – they’re tucked away deep in a strip mall, between Gallo’s Tap Room and Micro Center off Bethel Road. 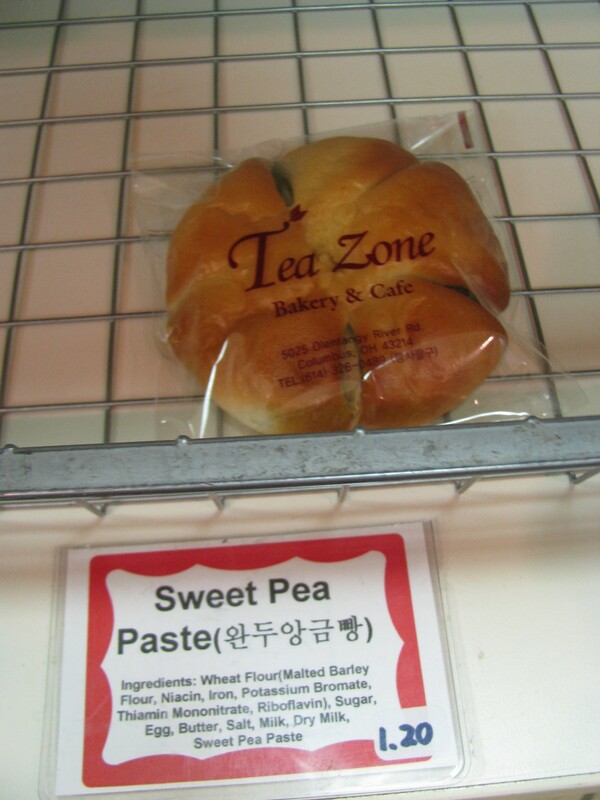 Tea Zone’s offerings struck us as largely bakery-centric with Korean-style bread and pastries as well as cakes to order. The pastries range from kimchi rolls (surprisingly sweet and very good) to piggies in blanket (a hot dog in a slightly sweet bread base) to sweet pea and red bean paste (both enjoyed). There is a large variety, especially earlier in the day. There are three traditional low tea tables, set on a raised wooden platform with a submerged area for your legs to dangle. Not unlike a Japanese tatami room, you must take off your shoes. There are also some regular tables and chairs and a brisk take out business. 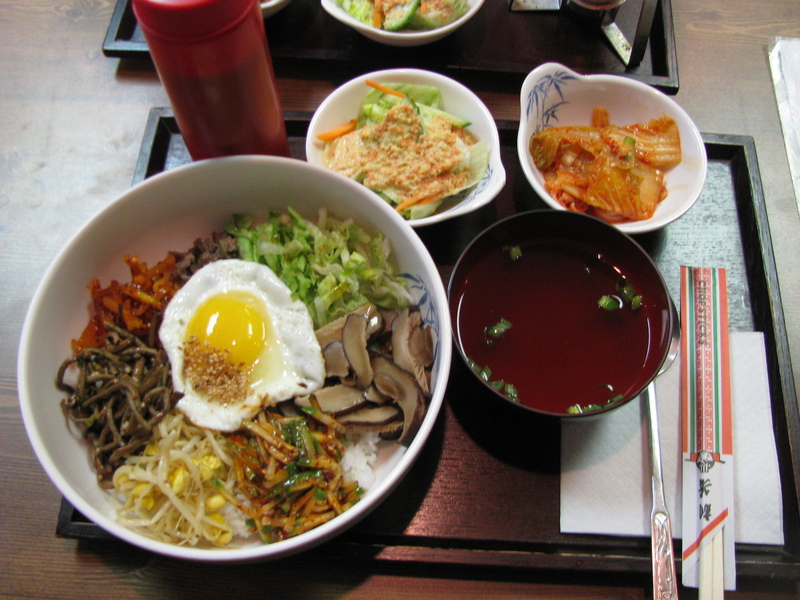 Tea Zone’s food menu is limited and includes popular Korean dishes such as bulgogi and bibimbap (not stone pot). While the bibimbap was fine, the bulgogi was far from the best in town. Each came with soup, salad and kimchi. You can also order udon, cold noodles, spicy seafood with rice even spaghetti with garlic toast. 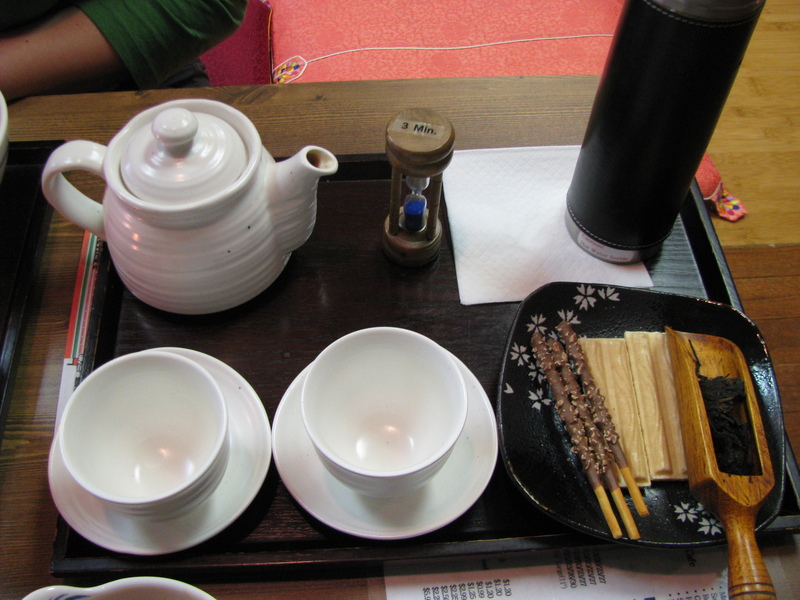 A pot of tea (shared between two) is $4.25 and comes with some little Pocky-esque cookie sticks. There are over 20 teas to choose from and Tea Zone also serves bubble tea, smoothies, hot chocolate, juice and coffee. Most of the teas are loose leaf, although I did notice some herbal tea bags. Our Pu-er tea came in a scoop accompanied by a flask of hot water and a 3 minute timer. Perhaps one of the best reasons to go to Tea Zone is for the bing soo, a Korean shaved ice dessert (although it is listed on the drinks menu). 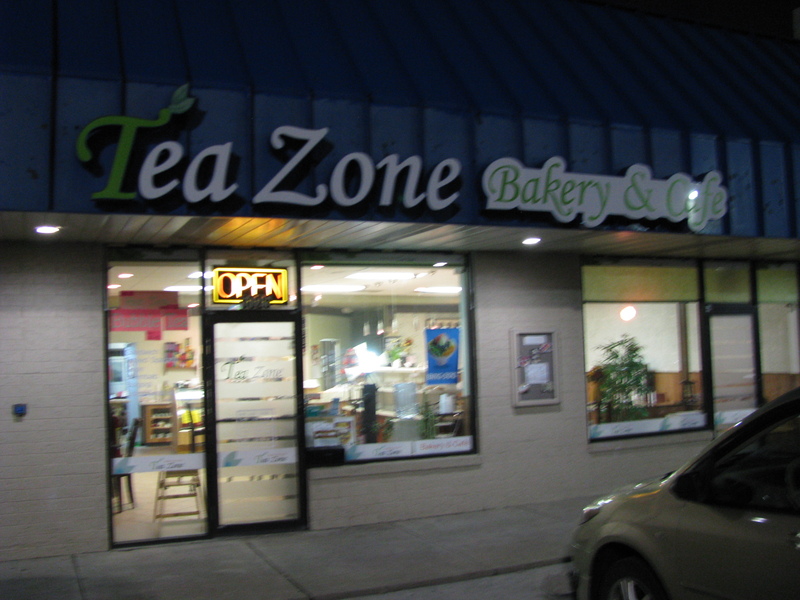 Tea Zone offers 3 varieties: fruit, regular and green tea. We opted for the regular. 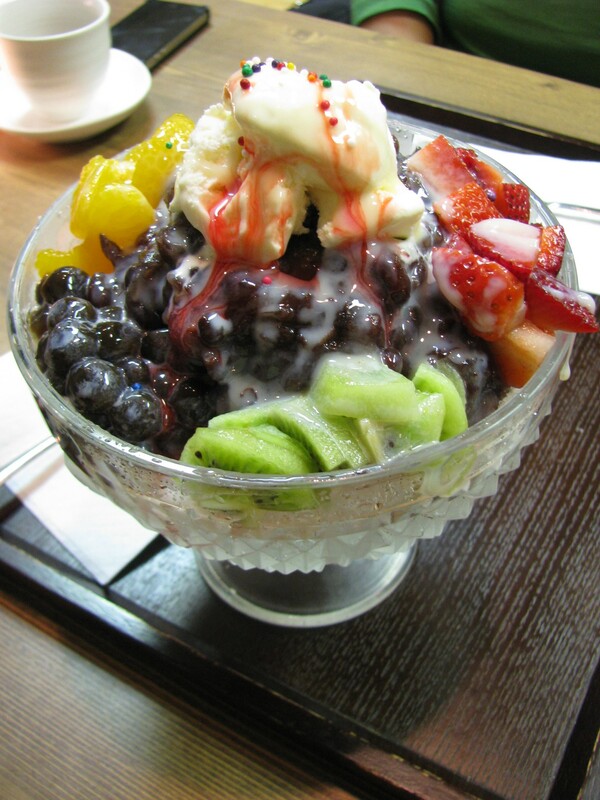 It is a large dish of shaved ice topped with condensed milk, sweet red bean paste, tapioca pearls, fresh and canned fruits, and ice cream. The fruit option has less red bean paste and the green tea option has green tea ice cream. Bing soo is similar to other shaved ice desserts found in Asia. Tea Zone’s version is definitely large enough to share. It is quite sweet but refreshing and would be wonderful on a hot afternoon. This entry was posted in Bakery, Korean, Restaurant. Bookmark the permalink. Have you tried or heard of their fruit cake? I’ve been trying to pick between ordering from Golden Delight or Tea Zone since I’ve heard good things about their fruit cake. Jolie – I don’t believe we have tried or heard anything about Tea Zone’s fruit cake. If you choose to give it a try, we’d like to hear what you think of it! I really like this place. Just wish they had better quality and more variety of looseleaf tea from China/Taiwan/India/Vietnam/Indonesia. First thing I do when I arrive is check the discount bin.